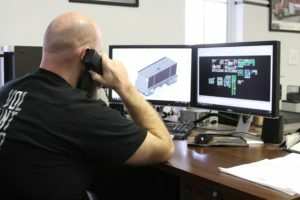 ENGINEERING CORNER: SolidWords 3D Modeling – Pro Poly of America, Inc.
At Pro Poly, our attention to detail and commitment to quality starts at the inception of the build cycle with the very best software for design, SolidWorks 3D modeling. We interface with our customer base carefully to craft a very detailed design to meet the exact requirements of the customer application. We then carefully design the configuration using our ISO 9001 certified fabrication techniques, as well as our 27 years of tank and body construction. The result of the process is a very careful design package and a strong, durable and “Bull Tough” product to meet the heavy demands of our customer’s applications. Let us show you how our 3D models turn your ideas into reality.